I love to snack in the evenings and at times between breakfast and lunch. Many a time it is something rich and indulgent but most of the times it is fruit and dried fruits and nuts. I almost always make sure that there are savoury Indian snacks like spiced puffed (murmura) and flat (poha) rice as much as there are cookies in my jars. The latest addition to my list of snacks is this savoury roasted wonder which I almost can’t do without these days. Hari loves it too so its a great, healthy snack for kids and grownups alike. I call it the Indian version of pop corn. 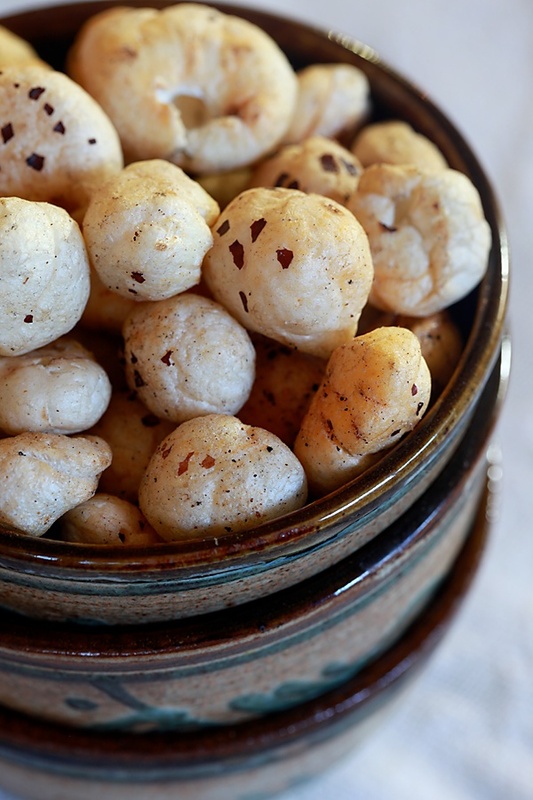 Popularly known as “Makhana” in India, Euryale ferox or fox nut is native to eastern Asia and Russia. It might interest you to know that the Chinese have been growing this for over 3,000 years and is used in Chinese medicine. In certain cultures it is also considered as an auspicious offering to the lord in religious ceremonies. Grown in the stagnant waters of wetlands, tanks, ponds and lakes, it is naturally organic too. Besides, it is nutritionally dense, loaded with calcium, phosphorous, kerotine, iron, zinc, and vitamin B. This snack is very easy to make and stays fresh for upto 2 weeks or more in an air tight container. 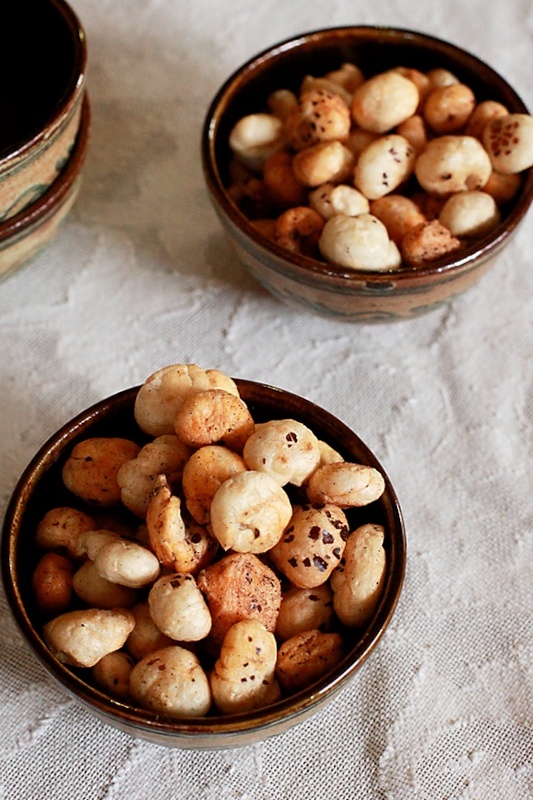 It is puffed, light and when roasted and spiced adequately it can become crunchy and zingy too! It has become one of my favourite snacks at home and also when I travel. Getting stuck in Mumbai traffic is nightmarish, but snacks like these and some good music come to rescue the weary traveller! In a large wok or kadhai, heat the ghee over a medium flame. When it melts, lower the flame and put in the red chilli powder and salt. Quickly toss in the makhana before the chilli begins to burn and mix well. Add in some freshly ground pepper and roast over low heat until the nuts are crispy, about ten minutes. Store in air tight containers and enjoy as a snack! Such an awesome recipe! I have never used makhana before. Everything I saw a pack of it in my grocery store, I would decide to look up the net, find a recipe and try it because it looks so pretty. Somehow never got around to trying it. 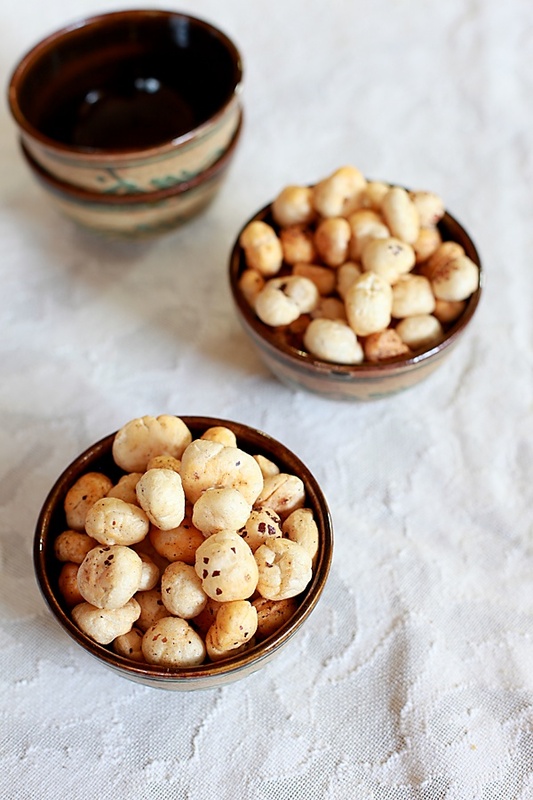 Thanks for this incredible roasted foxnuts,i have a bag of these nuts,yet to try them in my cooking,will start definitely with this roast..
Chinmayie: I'm sure you will love this snack! Pratibha: It is indeed very healthy and so simple to make! Avantika: How nice to hear that! Hope Ved loves it like Hari! Keerthana: I'm sure you might find them in an Indian store abroad. you don't have to wait till you come to Indian next! Fantastic snack. Happy New Year to you and yours! This sounds like a nutritious snack for my 1.5 yr old's play school snack box… Will try it right away. My name is Shruti & I am a new reader of your blog. I really liked your recipes. I am new to cooking and want to try this recipe. Can u tell which brand of Makhana to buy? shruti: You can buy any brand from the market. I dont use any specific one, infact I buy it loose from a store nearby. All the best in all your cooking ventures. Hey.. I am such a fan of roasted makhana. I used to get them way too easily in delhi. At a loss as to where I find them in Bangalore. Kripa: Makhana is available in Bangalore..You will have to look for it in dry fruit stores or big departmental stores. Prashant Nayak: Thank you for your feedback. I agree, makhana is such a versatile ingredient and so many things can be made with it. Need to know ehere can i get roasted makkana or foxnut in Bangalore. Ramya- Thanks for the feedback and the information.